Why go to Japan? Simon asks right in the middle of our planning stage. This question so late in the day – with the funds raised, Japan experts tracked and lured, the flights booked, the appointments almost booked and accommodation websites papering our computers – is so alarming and so infuriating it has to be the right one to ask. So I ignore it. Briefly. Why in Deed? given that the Brontë children created entire worlds over which they ruled violently and omnipotently in the bowels of the Parsonage cellar, flying on the unclipped wings of their own imaginations? Given that, as instigator and future composer / compositor of this score, whatever it is going to be after two and a half (and in some ways forty) years’ gestation, I repudiate the so-called “real world” as a ball jerked into an unfortunate groove of the roulette wheel by the patriarchal hand pulling a lever under the table at the worst possible moment? Given that Japan is violent, tender, ineffable, inscrutable, patriarchal, opaque and gloriously, terrifyingly other, and would never yield an inch to 14 days probing by the colossal ignorance of three Occidental mono-linguists (two of them feminist and the third post-feminist)? We all share a passion for landscape and the earth though, and it then occurs to me to remember Amaterasu: Shinto Goddess of the Sun. Though neither we nor She have ever met, and at least one of us has never heard of her. I had, I suddenly remember. My Ur-Play in 2003, Sweet Fanny Adams in Eden (made with Leo Warner and Rob Sharp of 59 Productions and Stellar Quines) practised freeing up male structures with quantum mechanics (before it was the fashion) all over an unfinished garden in Pitlochry. Natsume Soseki, Japan’s Shakespeare I have now discovered while researching this strange project, once identified Pitlochry as Eden and London as Hell, so his research trip to the UK (1900-1902) had sorted out some really important stuff, in just the style we hope to employ in Japan. It’s a strange and spooky bit of Action at a Distance (as Einstein gloomily described quanta spinning together, against all logic, through time and distance either side of the globe) that back in 2003 I buried Amaterasu the raging goddess of destruction and life underneath Pitlochry Theatre’s unfinished Plant Collectors’ Garden, pinned down at all her joints by Buddhist Temples. In my play, her child Avatar, Lily – a red Riding Hood childmonster that could have birthed from the head of Angela Carter – runs around the spinning script modules being reshuffled at the various temple sites, knocking them on different trajectories until the six other main protagonists Showman (God), Architect (Jesus) and Gardener (Adam), Bumps (Gertrude Jekyll), Cory (Vita Sackville-West) and Mina (Marianne North) discover exactly which fairy tale loop they are in, and which one they could be in. Consigned on each loop to die horribly many times and cheerily resurrect, Lily finally places her hand against the incident tent of her latest dismemberment and a giant hand raises from the ground to touch her fingers. The goddess rises through her Avatar girlchild, through the Scots pines, in a great earthquake to remake the world another Way. Dig deep enough, or rise high enough, and the world is Other than we think – or than the capitalists thought and still think. It is and has always been Quantum. Things. Flesh. Matter passing through, and being, time and space. A religion no-one quite understands and everyone shares with no sacred text is a miracle indeed. It is a book scrawled in the margins of what is left of the world’s natural resources, like Cathy’s diary in the margins of the family Bible: her message in a bottle to Lockwood before she smashes his window and bleeds on his bed. A ghost bleeds. This is very Japanese. Why Japan? To explore why so many Japanese see Emily as a case for Manga. Why Japan? Emily Brontë set her imaginary childhood queendom, Gondal, in the North Pacific, I remember. If that’s not a quantum leap say I, what is? 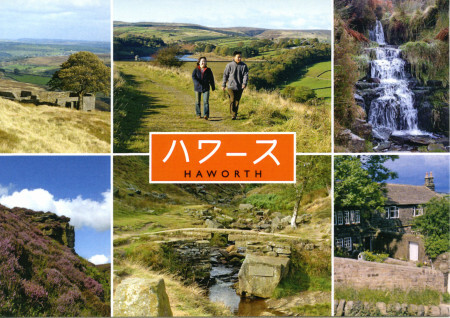 Her heart, however, lies in the moors of Haworth – outside my window now as I type. In the cotton grass and wind and good earth, where I walk daily. I need to tread a place in the earth and wind of Japan truly liminal in the same way. Can we find it, and where can we? Hokkaido? Northern Honshu? Matsue – in Lockwood/Lafcadio’s study? On a Noh stage in Kyoto? Soaking in onsen? I hope the last….because then, it is everywhere and nowhere. Like water. We’re going to Japan to ask it a question. One we haven’t formulated yet – or many questions. To visit the places Lafcadio Hearn, also an outsider, also a Celtic pagan at heart, dug to unearth the unearthly ghost tales his wife acted out for him. To sensitise ourselves to the feel of another side to our double helix story, passing through the globe that is a two-way cloud-mirror (Ungaikyou*) of many souls, from East to West, cancelling the Otherness into One. To find a world created between them, perhaps. Third and as real.